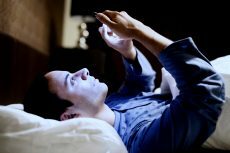 While some smartphones have a nighttime “do not disturb” setting, a sleep expert has looked at the brightness of new phone screens and says that’s not enough. The ongoing problem with having smartphones, tablets, and even flat panel TVs in the bedroom is that they emit a wavelength of blue light that disrupts the body clock and interferes with sleeping patterns. “Since this type of light is likely to cause the most disruption to sleep as it most effectively suppresses melatonin and increases alertness, there needs to be the recognition that at night-time “brighter and bluer” is not synonymous with “better,” said Prof Paul Gringras, a doctor at Evelina Children’s Hospital in London and co-author of the new study . Gringas says the problem is that smartphones and tablet screens have gotten bigger and bigger every year, and the light they emit has gotten brighter at the same time. While we wait for phone manufacturers to implement Gringas’ suggestions, your best bet is to keep electronics out of the bedroom as much as possible. If you have to keep your phone in your room while you sleep, a good compromise is to leave it face down on the other side of the room. To learn more about how smartphones and tablets can ruin your sleep, check out these SleepBetter articles.